Organizations evolve over time. Companies are no exception. And if the company you work for is changing, you need to adapt. If you don’t or can’t stay relevant, you may find that the organization has moved beyond your skills. Over and over I see the same situation play out. An organization goes in a new direction and employees cannot adapt to the resulting changes. Sometime it’s a bad hiring decision. But often it’s just a failure to stay relevant, keep abreast of the changes. and put in the effort to change. It’s difficult to get hired. Finding a job that fits your needs economically, professionally, and personally is challenging. There’s nothing wrong with walking away, but it’s better if you can plan your escape rather than having it forced upon you. Staying relevant in your organization keeps you in a favorable position, opening more doors, and paving the way for a future of your own design. Growth. As a company grows, the skills required to manage different departments changes. For example, when your company employs 100 people, the payroll manager can physically look at every paycheck before it goes out. But when your company grows to 10,000 employees, that’s no longer possible. The payroll manger’s job changes. Now the payroll manager needs to establish a process and put controls in place to make sure that each paycheck is accurate. If you are that payroll manager and you don’t adapt your skills, the company will grow beyond your abilities. Acquisition. When I was working in mergers and acquisitions, it wouldn’t be uncommon to see 80% of the employees in the acquired company leave within two years of being bought. Sometimes this was because roles and responsibilities shifted. The office manager in the acquired company was used to being in charge of nearly every aspect of the business. Once that business becomes a small part of a much larger organization, that office manager’s responsibilities seem significantly smaller. Also, in an acquisition, the corporate culture of the acquiring company takes over. If that culture conflicts with the smaller company’s culture, the employees will no longer feel that their goals and the company’s goals are aligned. Industry changes. Industries evolve over time. New competitors enter the market. Consumer behavior changes. Regulations can force changes in a company’s business model. The impact of the changes can be very rapid and may happen without anyone even noticing. The end result is that in order to survive, a company may need to make significant changes to how it does business. This may mean changing from a service company to a software company. And as a result of the change in business model, the skills required to thrive in the company may change. Management changes. Have you ever had a new boss get hired? Maybe one of your peers gets promoted. You know that everyone has a certain way of doing things. Different managers have different priorities and require different skills from their employees. Whether it’s your immediate supervisor that changes or someone high up in executive leadership. Either way, a management change may drive personnel changes. Have you done everything you can to make sure you’re the one that keeps their job? Technology changes. You may be an Excel guru, but if your company has migrated away from Excel and now uses Tableau for all its data analytics, you are an expert in a technology that is no longer required. Of course if you’re in an information technology role, it goes without saying that you need to be current, but even if you’re in another department, technology has become essentially for everybody today. There was a time when I would make an acquisition and the seller would literally keep their accounts receivable on index cards. Remember when video rental stores kept their membership files on index cards? I can’t imagine that even the smallest business doesn’t have at least some level of technology today. Stay current on new technologies whether they are used in your position or not. Companies are regularly introducing new and improved technology into the organization. If you are up to speed on what is available in the market, you can increase your value within the organization. Keep informed about what is happening in your industry. Read trade journals. Follow industry blogs. Ask around your company for what sources others use to stay abreast of trends. Becoming an industry expert is a sure way to maintain or grow your level of responsibility in a company. Network internally with other employees throughout your company. The more people you know the better. The stronger your internal relationships the better. Keep aware of growth areas within your company and try to position yourself to take advantage. Consider going back to school. If you didn’t finish college, go get those last remaining credit hours and earn your degree. If you have an undergraduate degree, get an MBA. Or maybe enroll in an online certification program. These all demonstrate a commitment to growth and learning new skills. Join and become active in a professional association. As a financial professional, I am a member of the CFA Institute, the Financial Executive Networking Group, and Financial Executives International. These are organizations consisting of other professionals in similar roles with similar backgrounds. These organizations can help you stay current on industry trends but also serve as a source for new opportunities should you have that need. Staying relevant in today’s business world is more important than ever. But with the resources available to you today, it’s easier than ever. It just takes planning and a little effort. 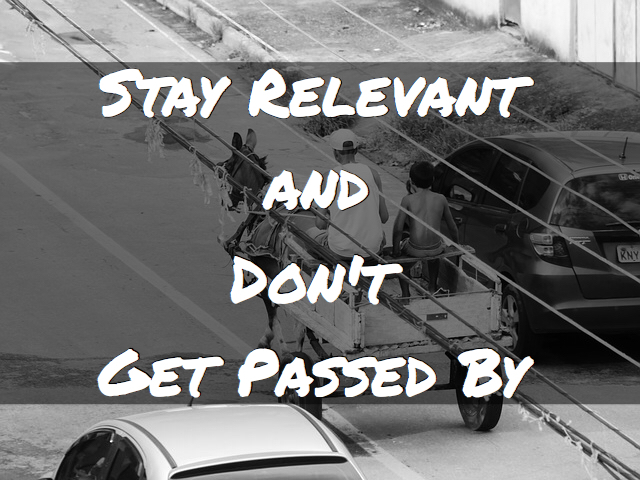 Do what you can to make sure you stay relevant and don’t let your company pass you by. Have any of you been involved in situations where employees were passed by as their company evolved over time? How do you prevent yourself from becoming obsolete and stay relevant?